The BB Multi Currency RSI shows the RSI value broken down to each important currency. 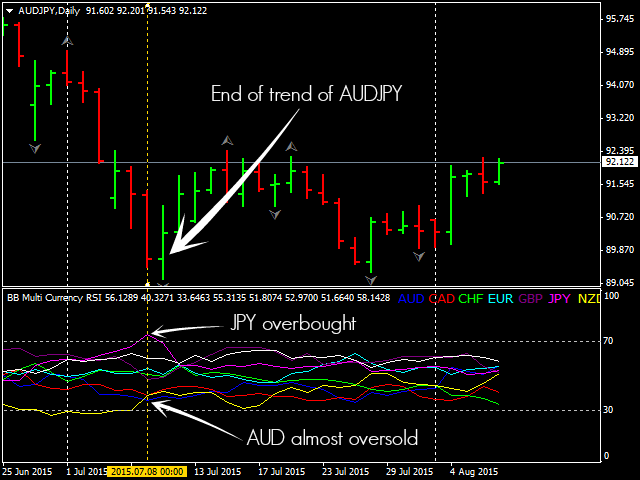 It compares RSI values of all supported currency pairs with each other and draws the average value in a line chart. You can keep track of all important currencies (AUD, CAD, CHF, EUR, GBP, JPY, NZD, and USD) at a glance and see which currency is the most oversold/overbought. It may help to find good reversal or breakout levels. 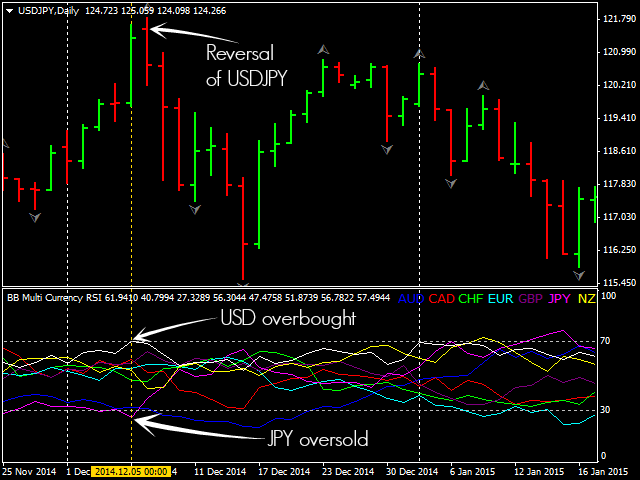 RSI Period - period of the RSI indicator the calculations are based on. History Bars - how many bars to go back in history. If you like it, please rate and review it. Why not ? A currency label at the end of the line. One of my favourite indicators on the market! This is a bomb. Absolutely genial. And free...I change RSI lookbackperiod to 20, levels to 35, 50 and 65 (30-70 is outdated, markets arent so volitile as before). If you closely monitor it 3-6 timeframes of this indicator you will be very successfull. 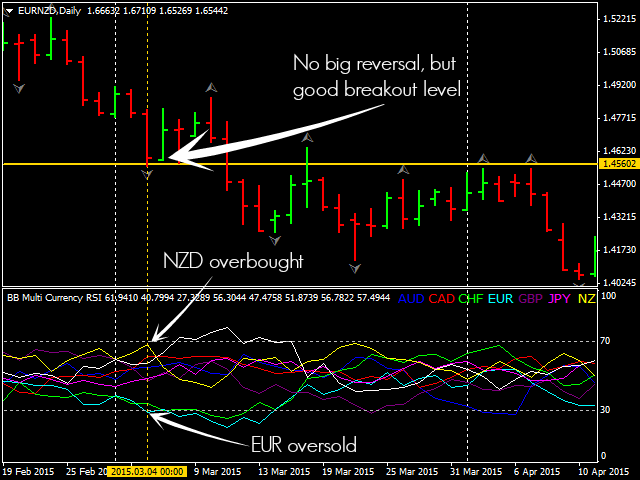 I just opened a trade on EURCAD using this indicator. I didnt even manage to set tp and or sl when it was already 23 pips in my favour within a blink of an eye. Thank you so much Bertwin! God bless! Very good indicator which can alert of a possible reversal setup coming. To be used with other tools to decide entry, SL and TP. Thank you for offering it free. It sometimes slows down the platform a bit though. Thank you for such a great and useful indicator.